Check-in: Check-in time is at or after 3 PM. Early check-in is based upon availability. Our registration desk is open 24 hours a day. Check-out: Guests check-out time is by 12 PM. Vehicles and luggage may be left at the facility beyond check-out time based on storage space and parking availability. Cancellation Policy: Please cancel reservations at least 24 hours prior to your scheduled arrival date to avoid a one-night room charge. Pets: Pets are not permitted at the Berkeley Lab Guest House. Assistance animals are always welcome. Please let the staff know if you plan to arrive with an assistance animal. Smoking: Smoking is not permitted in the Guest House. Please use designated smoking areas only. No minors under the age of 18 are permitted to stay at the Guest House. 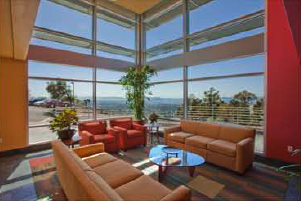 Eligible guests include individuals or groups that have business with LBNL or UC Berkeley. All guests must provide host information at the time of making a reservation. Please do not have any packages or material related to your work sent to the Guest House. Send such items to the scientific department hosting your stay at Berkeley Lab. Daily mail service delivery for the Guest House is provided Monday through Friday by Berkeley Lab.